Liu Shaoqi Important Communist party members purged during the Cultural Revolution included Deng Xiaoping and Mao's right-hand man Lin Biao. In 1966, Deng was labeled as the "No. 2 Capitalist Roader" and stripped of his position as Party General Secretary. 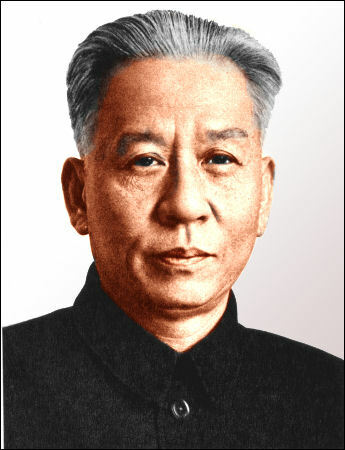 During a humiliating self criticism session Deng was accused of being a "fascist," a "traitor" and a practitioner of cat-ism (a reference to his white cat, black cat remark). During the sessions, Red Guards shouted, "Cook the dog's head in boiling oil!" When the noise became too much, Deng used to remove his hearing aid. Deng was rehabilitated in 1973. Yao Wenyuan later admitted he was behind the trumped charged against Deng. Deng’s son, Deng Pufang, was harassed by Red Guards for refusing to "expose" his father and for being disloyal to Mao Zedong. In 1968, he wrote a suicide note, leaped from a third-floor window to escape torture, and was paralyzed from the waist down. Now he is China's most influential advocate for the disabled. Deng younger brother was driven to suicide by Red Guard attacks. Deng himself was put under house in Beijing for two years and then sent to Jiangxi province where worked in a tractor-repair factory and was confined to an infantry school, a fate that could have much worse. Later he said, "Chairman Mao protected me." Later, Mao uncharacteristically apologized to Deng for the ordeal. Image Sources: Poster, Landsberger Posters http://www.iisg.nl/~landsberger/. photos: Everyday Life in Maoist China.org everydaylifeinmaoistchina.org , Ohio State University ; Wiki Commons, History in Pictures ; YouTube; Rong Guotuan: China Daily; Bian: CNN; Deng Pufang: China Digital Times.